OFFICIAL PLANS for the four routes under consideration for the North East Link have been released by the North East Link Authority (NELA). The four possible corridors were determined through geo-technical investigations, traffic modelling, environment studies and discussions with community groups, businesses and local residents. Premier Andrews made the announcement and said local roads in the north-east have become default freeways. “North East Link will fix that — carrying 100,000 vehicles a day and creating 5,000 jobs,” he said. However, Member for Warrandyte and Shadow Minister for Roads and Infrastructure, Ryan Smith told the Diary: “building the North East Link without a plan to build the East West Link will simply channel 100,000 vehicles a day onto an already gridlocked Eastern Freeway”. Of the four routes under consideration, two are set to run to the west of Warrandyte. The proposed Corridor B would cross the Yarra at Fitzsimons Lane and follow the current powerline reserve with an interchange at the Tindals Road and Reynolds Road intersection and join EastLink at the Ringwood end of the Mullum Mullum Tunnel. Proposed Corridor C would cross under the Yarra near Crystal Brook Caravan Park and follow the powerlines to the same interchange at Tindals Road. Both of these options would also incorporate upgrades to Reynolds and Springvale Roads. 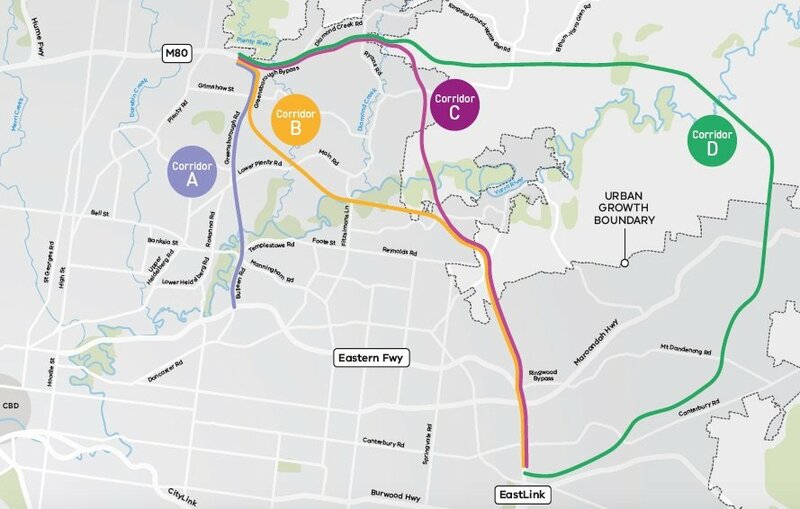 Further West, Corridor A is proposed to travel 11 kilometres directly south from Greensborough through the Banyule Flats to connect with the Eastern Freeway at Bulleen Road; this route would include an upgrade of the Eastern Freeway to accommodate the increased traffic volume. Corridor D is a sweeping 40-kilometre route which travels through Kangaroo Ground, Bend of Islands, Christmas Hills, Lilydale, Mooroolbark and Bayswater, with connection to Eastlink near the Burwood Highway. Extensive tunnels are planned to protect the environment and cultural assets: Corridor A will be 50% tunnel, Corridor B is planned to comprise a minimum 70% of tunnels over its 24-kilometre length, while Corridor C will have 55% of its 26-kilometre route underground and around 40% of Corridor D will be tunnelled. Ryan Smith said that having these four corridor options on the table “with a significant lack of detail, Daniel Andrews has created an extreme level of anxiety amongst residents who will potentially have their homes acquired”. NELA Communication and Stakeholder Engagement officer, Kim Jordan, who presented the plans to local community groups said that NELA have discussed using the powerline reserves with AusNet and they said that to place the high voltage lines underground would not be feasible with the existing reserve. “That leaves us putting the road underground and leaving the powerlines where they are,” Ms Jordon said. • Minimise impacts in communities. • Minimise impacts on environment and cultural assets. • Minimise impacts during construction. • Optimise efficient use of resources. Residents are invited to attend local information sessions during August or can provide their feedback online. There will be an information session on August 19 at Warrandyte Primary school where residents can give feedback to NELA about the proposed routes. The Diary will supply publish the NELA technical report on this website when it is made available, in the mean time, more details on the corridor options can be found here. 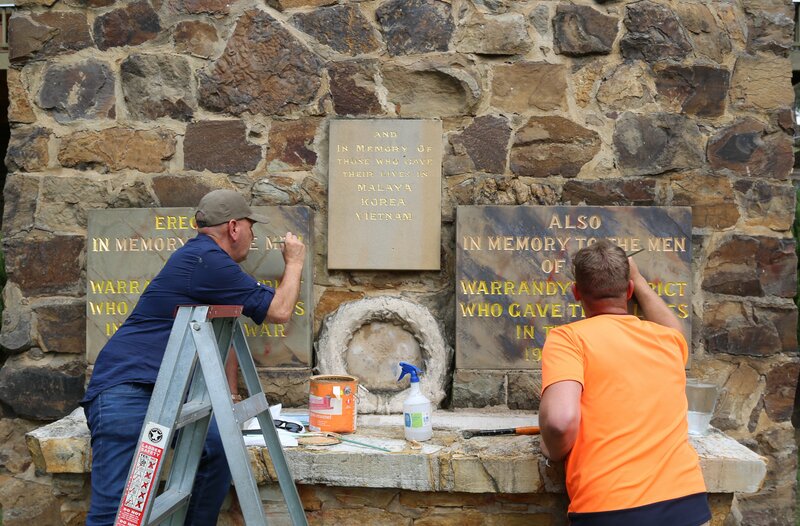 The Warrandyte Community Association (WCA) says that it is actively preparing for the short feedback period. Convenor for the WCA’s North East Link subcommittee, Carli Lange-Boutle, says “the WCA is collaborating with other associations along the Greensborough-Eltham-Park Orchards-Donvale-Ringwood Route corridor to identify the potential benefits and impacts of the options. Ms Lange-Boutle advises that each association continues to work to their individual objectives and priorities. “The WCA’s priority is to help defend our village character, our natural Yarra River valley bush setting and the surrounding Green Wedge buffers”, she continued. “The Park Orchards and Donvale communities are worried about potential impact on the Mullum Mullum Creek corridor and about traffic issues. Ms Lange-Boutle said “We are devoting considerable effort into encouraging Manningham Council and residents that now is the time to get involved. Ms Lange-Boutle said the WCA hoped “Warrandyte residents would take an active interest in this issue”. These sessions continue the community consultation which commenced last month. NELA received 7000 responses to their online survey and found the community’s three main issues were: protection of the environment, public transport and urban design. Last month, residents of Nillumbik were given the opportunity to attend a series of pop-up meetings held by NELA, which were initiated by Nillumbik Council Officers and councillors Karen Egan and Jane Ashton. Residents asked many questions of the NELA community engagement team with many of the question raised during the first pop-up meeting in Eltham concerned primarily with the routes plan to run through Warrandyte and Kangaroo Ground. Narelle Campbell has attended several of the pop-up meetings as a concerned resident of the Green Wedge. She told the Diary that NELA appeared receptive and welcoming of discussions. “The NELA and Nillumbik Council pop-up sessions give us the opportunity to talk to NELA with our issues face to face,” she said. Ms Campbell said that Nillumbik residents have been “turning up to these sessions to make sure NELA acknowledges and can articulate all of the reasons why a rural Nillumbik Green Wedge option is a bad idea in its own right and achieves a poor project outcome when compared to other North East Link options”. Ms Campbell gave the Diary her impression of the reality faced by the North East Link Authority. “The reality is that all North East Link Project options impact on people, homes, the environment, and create engineering challenges — there is no ‘easy’ build option, completing the Link now is about identifying the ‘least worst’ project option to achieve project benefits,” she said. As reported in the May edition of the Diary, The Victorian Transport Association (VTA) have been advocating for a wholly aboveground option. “Tunnels are expensive to build, prolong construction timelines, and cannot accommodate dangerous goods vehicles, which forces them onto other roads, impacting community amenity,” VTA CEO Peter Anderson said earlier this year. However, Ms Jordon said the VTA’s preferred route through Chirnside Park would require some tunnelling, and that only around 1% of trucks carry dangerous goods. Ryan Smith said the proposed North East link routes are an unprecedented attack on the Green Wedge. “Daniel Andrews seems not to know or care about the impact this project will have on the local environment, Mr Smith said. A final decision on the final route will be announced by the end of the year, with the Premier saying contracts would be signed in 2019 and construction commencing in 2020. AFTER 17 RECORDED vehicle crashes in four years, Manningham Council began the process for a major upgrade to Jumping Creek Road in July 2016. At an estimated cost of $17.9M and a construction period of six years, works are scheduled to begin in 2018, after the next fire danger period has ended and assuming the necessary permits have been issued. An important link road between Warrandyte and the Yarra Valley, the road also gives access to the only river crossing with 10 kilometres for Wonga Park and the surrounding area. Manningham Council estimates Jumping Creek Road currently carries more than 8000 vehicles per day, a number which is expected to of doubled by 2035. Taking into account the number of accidents on this important artery, Manningham believe the road, which is already failing to keep drivers safe will be unable to accommodate a major increase in traffic without an upgrade. 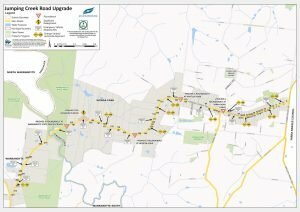 The works will include roadway realignment, roundabouts, emergency vehicle stopping bays and a shared pedestrian/cycling path which will run the entire length of Jumping Creek Road between Wonga Park and Warrandyte. This last adjustment will deliver greater accessibility to the Wonga Park community as well as improving safety for cyclists and pedestrians. As part of the development process, Manningham Council have formed the Jumping Creek Road Community Reference Panel, a panel which consists of residents, businesses and community groups which are directly affected by Jumping Creek Road. Mr Leigh Harrison, Director of Assets and Engineering for Manningham Council spoke to the Diary, explaining the role the panel will play in the forthcoming upgrade. “The Jumping Creek Road Community Reference Panel will provide an important and long term opportunity for the community to highlight issues, queries and provide feedback on proposals to upgrade Jumping Creek Road. “[The panel] will also help guide the materials and finishes, path widths, replanting opportunities, fauna crossings, street lighting, pedestrian crossing locations, non-regulatory signage, roadside aesthetics, emergency stopping bay locations, the Dudley Road/Yarra Road/Jumping Creek Road intersection surface treatment and the extent and nature of equestrian treatments,” he said. 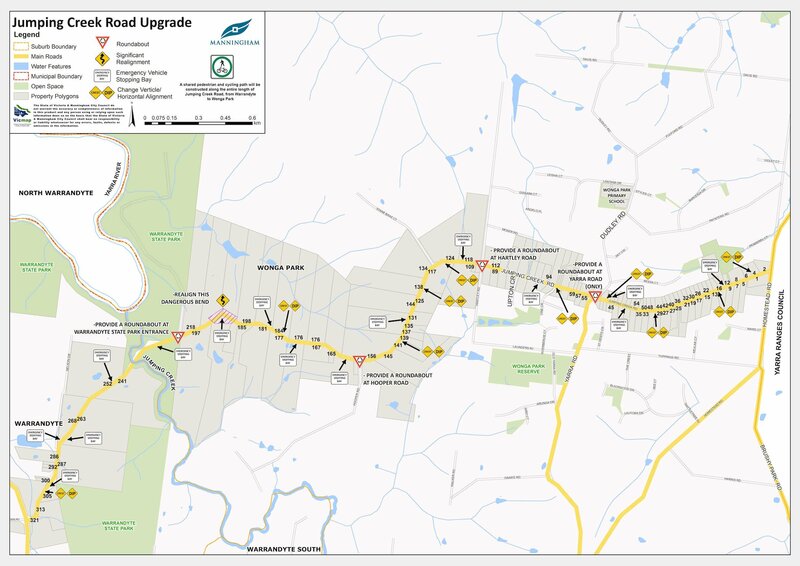 Residents will get the opportunity to express their thoughts on the road upgrade via the Community Reference Panel, as well as via the Manningham “Your Say” page. However, one major concern will be traffic congestion. The Diary asked Mr Harrison what steps have been taken to minimise further congestion to an already heavily congested area. “The key objectives of this project are to improve safety for all users, including motorists, cyclists and pedestrians, and to accommodate the forecasted increase in traffic volumes — which is expected to double to 15,000 vehicles per day by 2035. “During our consultation process, concerns were raised about traffic congestion at the Jumping Creek Road and Homestead Road intersection — located on the municipal boundary between the Shire of Yarra Ranges and the City of Manningham. “Council is working with the Shire of Yarra Ranges to address resident concerns regarding this intersection. “Some traffic disruption during works of this scale is unavoidable,” he said. What will CFA changes mean for Warrandyte? THE VICTORIAN Government has announced sweeping changes to the fire services which will split the CFA, and while it fundamentally will have no impact on the business of putting out fires, there will be a big change in the way CFA brigades operate behind the scenes. A joint statement issued by Premier Daniel Andrews and Emergency Services Minister, James Merlino, said Victoria has some of the best firefighters in the world, however they currently operate under systems and structures that have not changed since the 1950s. “These important changes will deliver more modern fire services for a growing Victoria, making our state even safer”, said Mr Merlino. Emergency Services commissioner, Craig Lapsley spoke to the Diary to reassure local residents and CFA volunteers the change for the community would be seamless. “We have 1220 CFA stations now, and we will have 1220 when this is implemented,” he said. CFA staff such as those at South Warrandyte will combine with MFB firefighters to form the newly created Fire Rescue Victoria, while CFA volunteers will remain with the CFA, which will return to being a volunteer focused organisation. “It will still be local people going to local incidents… the same vehicles will be in the same stations, it is just that the signs out the front will be different” he said. South Warrandyte Station as an integrated station will remain the same, but will have two signs, one representing the FRV staff and the other representing the CFA volunteers. The situation for other roles within CFA — such as regional managers and staff, community education, trainers, mechanics, fire investigators — is a slightly more complicated issue. “Operational staff at a Regional level will be employed by FRV but will be tasked to the CFA, however certain administration and technical staff will remain covered by the CFA’s [Professional Technical & Administrative] PTA employment agreement,” Mr Laspley said. The Commissioner assured the Diary the boundaries between metropolitan and country areas will remain the same, however the Andrews Government has flagged the establishment of a Fire District Review Panel which will conduct future reviews of the boundary between fire services, based on population growth, urban development and the volume of Triple Zero calls. When the Diary asked about the rumours generated by a photograph published in the Herald Sun showing Warrandyte was being considered for inclusion in FRV, Commissioner Lapsley said there were “no immediate plans to put staff into Warrandyte”. 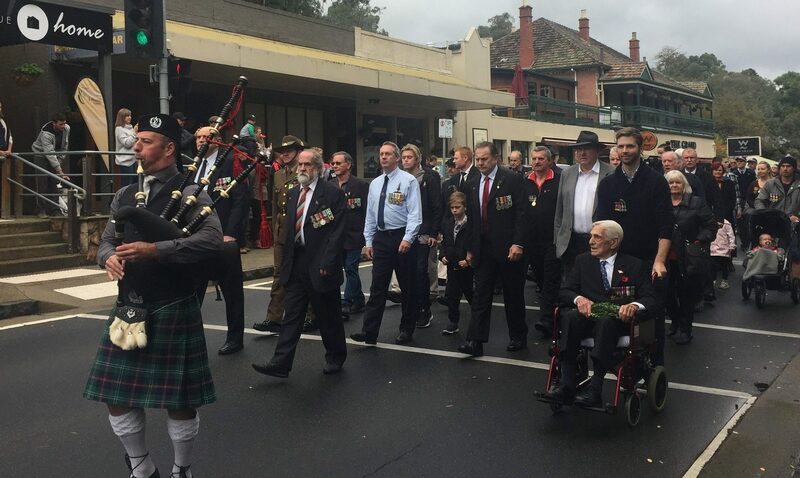 He said that the position paid fire fighters in South Warrandyte, Eltham and Templestowe gave enough coverage to support the retention of a volunteer-only station at Warrandyte. “South Warrandyte are getting into Yarra Street in 8-10 minutes”, he said. Commissioner Lapsley said one of the most important consideration is to ensure surge capacity in times of major incident is protected, and that means ensuring we retain the State’s 50,000 volunteers. Local member for Warrandyte, Ryan Smith is not so optimistic, and said volunteer retention at integrated stations may not be so easy. “Sooner or later if you have 20 or so career firefighters there, volunteers aren’t going to get there for a call out and it’ll get to the point that they don’t want to be there to wash the trucks once a week”, Mr Smith said. Mr Smith is concerned that if volunteers are not given respect they will not be there in times of calamity to provide the needed surge capacity. 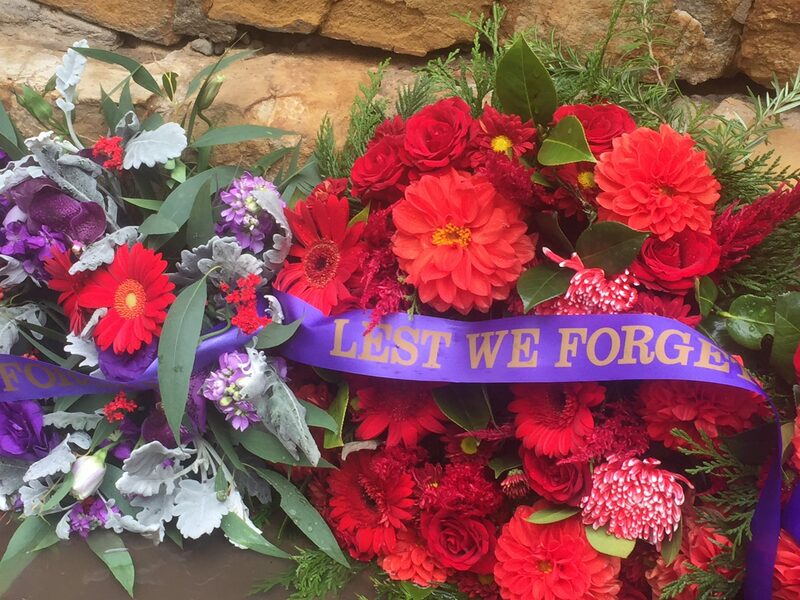 Peter De Maria, a career firefighter at South Warrandyte, said the feeling at the station was positive and the change was little more than a change of badge. “It’s no different — really it is not going to change, we will still train with [the volunteers], it is just modernising the service for career staff… but for the community it is a win because they will get a better service,” he said. Captain at North Warrandyte CFA, Mick Keating hopes the CFA will continue to support volunteer training and skills development. “As long as they don’t make us a second rate service and say ‘you don’t need these courses, these trucks, this equipment’, we still have houses and big buildings to look after, we still have road accidents, none of that is going to change I just hope there is no change to any of the the training regime or the opportunities that are available to volunteers,” he said. 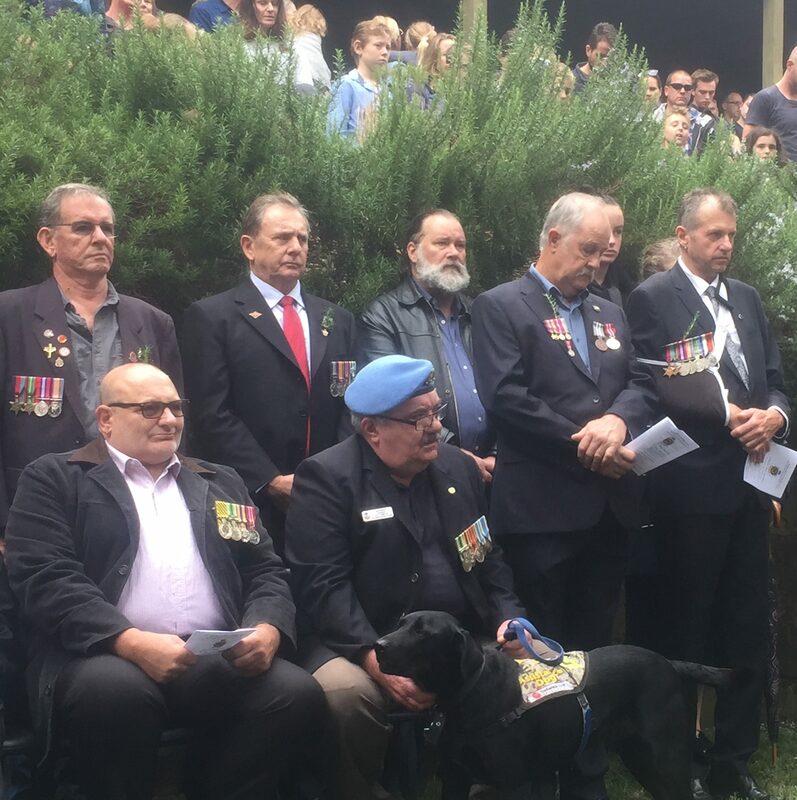 Captain of the Warrandyte brigade, Adrian Mullens said it was still too early to comment and would like to wait until the dust had settled on the announcement, but wanted to reassure the community that it would be “business as usual”. “We are still going to service the community as we have for the last 79 years,” Mr Mullens said. These reforms are currently before Parliament, and if passed, are expected to take two years to be fully implemented. Ryan Smith is not convinced that the reforms have the community’s interests at heart. “If it was driven for efficiencies or driven because the system was broken or to save money or whatever you could argue it was good for the community, but what you are going to be doing is basically breaking a community organisation that everyone rallies around…this is just a fix because every other way they wanted to support the UFU was blocked for various reasons — is it a win for the community? No – I think we will just end up missing something that we had,” he said. The government has confirmed that, until June 2019, the funding for the changes will not impact on the Fire Services Property Levy, which is charged to property owners via council rates. With this comes a promise that the existing Metropolitan Fire District Boundary will remain in place for the next two years — for the purpose of determining whether Metropolitan or CFA levy rates apply.